World Clock Widget shows the time anywhere in the world - quick and easy. A must have when you are traveling or are connected with people living in a different time zone. Being a Widget means that it works directly from the lock screen. You don't need to unlock your iPhone or iPad to use it. 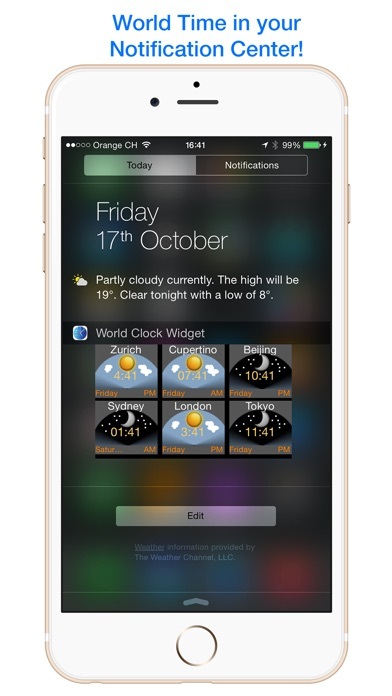 The World Clock Widget is a tool you won't miss again once you started to use it. The world clock Widget is one of the rare occasions where the easy way is better. It saves time and delivers exactly the information you wanted in a single swipe. What are you waiting for ... stop waking up your distant friends everytime you are calling them and get the World Clock Widget now! We would like to hear from you, so do not hesitate to drop a line or two for feedback and suggestions. And if you like this app, why not give it a good rating?